Drawing the human figure from observation is extremely challenging. Many do not get enough opportunity in school or in their praxis to experience the benefits of extensive study of the human form. Life drawing groups can be difficult to organize, models can be expensive. But Ialways happen to be around when I’m in need of practice! One of the ways I make sure to put time into the practice of drawing is to align it with daily routines already in place. I find that keeping a journal at hand for moments when inspiration strikes, or to prompt study even when not inspired, to be invaluable. 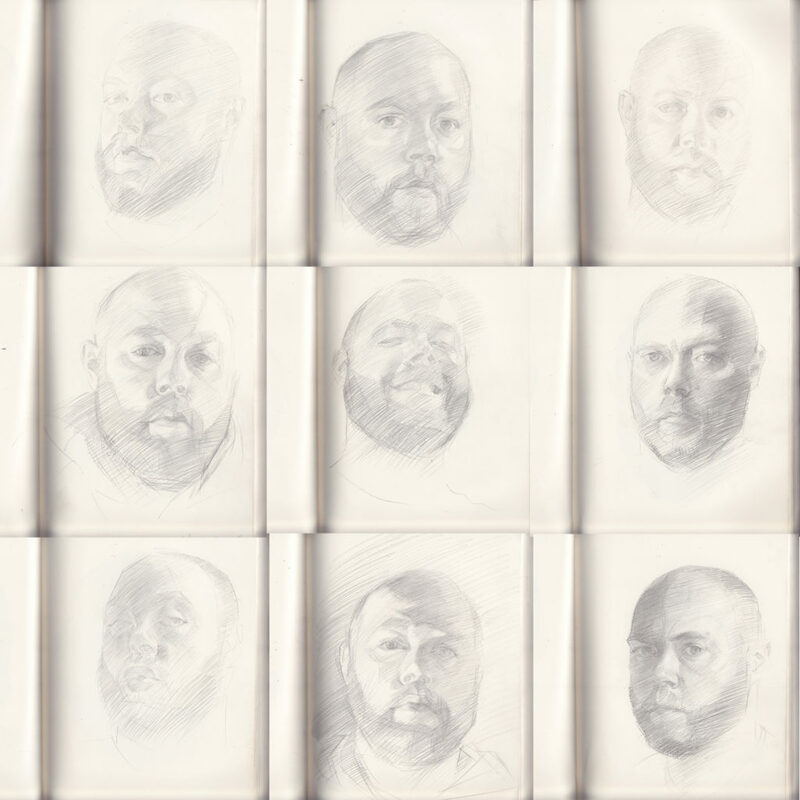 I received a small leather-bound sketchbook as a gift from my wife and I devoted it to self portraiture. I keep it in the bathroom, near the toilet. Capturing likeness demands, to a greater extent, the faculties of observational drawing. There seems to be no end to the subtlety of facial expressions. Lacan’s mirror stage is a phenomenon in developmental psychology when the child of 15-18 months recognizes themselves in the mirror, assuming their reflection. In order to reconcile the tension between the subject and the image, the child identifies with and is reduced to a symbolic abstraction. No matter how hard I try, I can’t distance myself from my own subjectivity. I will never see myself from point of view of someone else; nor can I understand my image as a whole, but only as a fragmented aggregate of snapshots, memories, and assumptions about what I look like. These drawings are inspired by the etchings of Rembrandt van Rijn. His self-effacing sense of humor and wit give his self portraits a vital sense of how he saw himself. I hope to catalogue the range of emotions I experience daily, in the most private of moments, when I am with the image of myself.